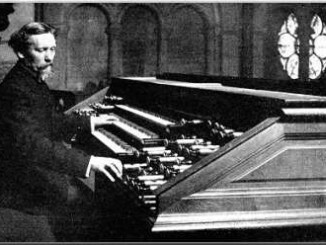 John Varley Roberts was a blunt Yorkshireman who was Organist and Choirmaster at Magdalen College, Oxford, between 1882 and 1918. During his time, the chapel choir, in the opinion of Sir Thomas Beecham and other notable musicians, became the finest of any cathedral, church, or chapel in the country. He was born in Stanningley, a hamlet in the parish of Bramley half way between Leeds and Bradford. His father, Joseph Varley Roberts, was a clothier and his brothers and sisters were also working in the clothing industry. Born in the last few weeks of 1841, he was baptised on the 2nd January, 1842, in the new Bramley church which had only just been opened. The curate, the Rev. James Chadwick, lodged with the Roberts family and may have been instrumental in introducing John to church music and a career as a teacher. Aged 17, he attended the Yorkshire Diocesan Training School for Masters in St Maurice, York (now York St John University) which had been founded in the year he was born. The school trained men for the teaching profession and the course included a wide range of subjects including practical mechanics. 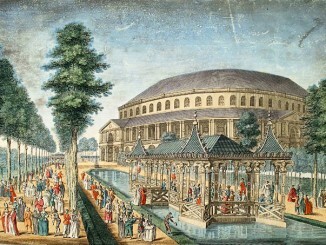 Aged 20, he secured the appointment as organist at St Bartholomew’s Church, Armley, near Leeds, and supplemented this income by teaching music. He was at Armley from 1862 to 1868 when he was appointed o rganist of the parish church in Halifax. He continued teaching and styled himself a professor of music. On the 30th April, 1866, at Ilkley Parish Church, he married Elizabeth Yates Jane Manning, who had been born in Montreal, Canada, the daughter of a clergyman. Their daughter, Gertrude, was born two years later in Armley. On 7th March, 1871, he matriculated at Oxford University through Christ Church College and successfully supplicated for the degree of Bachelor of Music four months later, on the 8th July. 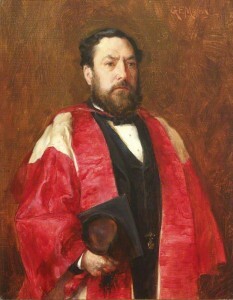 He was awarded the Oxford doctorate of music five years later on the 29th June, 1876. He continued as organist at Halifax until 1882 when he was appointed organist at Magdalen College, Oxford. As a married man he did not live in the college itself but in a college-owned house around the corner in Holywell Street. His duties at the college were similar to that of a cathedral organist in that he was in charge of the music for the daily services, although unlike cathedrals these were only held during the eight short weeks of each term. Roberts was both an excellent organist and choir trainer (he published a choir training manual in 1898) and it was during his time that many rated the Magdalen choir the best in the country. John Varley Roberts wrote a number of organ works and anthems for the services at Magdalen. His personal copies of the choral works were heavily annotated in pencil showing exactly how the organ accompaniment should be played. He was fortunate enough also to feature in a significant work of art by the Pre-Raphaelite painter Holman Hunt. It had long been the custom of Magdalen College choir (as it still is today) to greet the sun in the early morning of the 1st May each year with a special hymn sung from the top of the tower overlooking the river bridge. 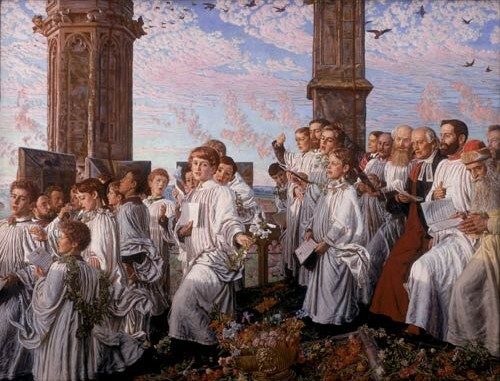 Hunt painted “May Morning on Magdalen Tower” throughout 1888 to 1890 (see above). The painting is not accurate with regard to the dramatis personae actually present at any single event but the bearded head of John Varley Roberts can be made out among the boys on the left as he conducts the choir. (Roberts complained that he had not been portrayed in a more significant position.) 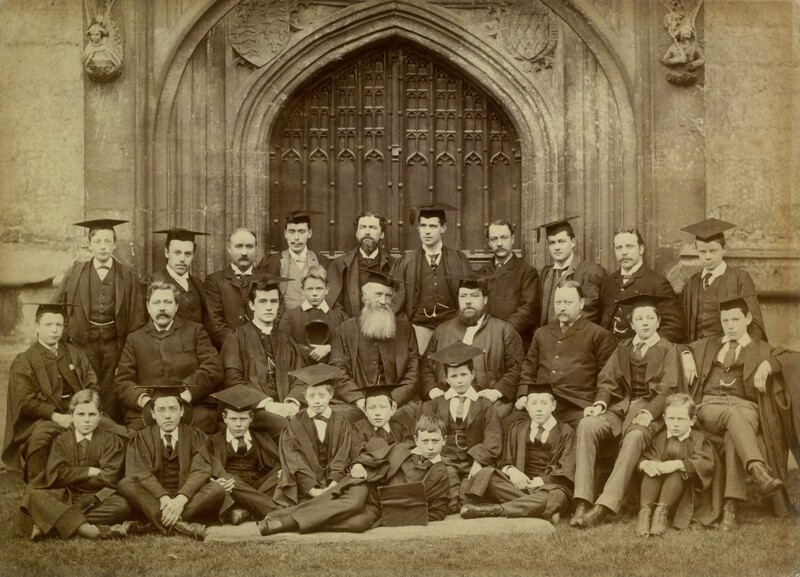 Among the men opposite him is another well known Victorian musician, Sir John Stainer, who had been one of John Varley Roberts’ predecessors at Magdalen. John Varley Roberts retired in 1918 but continued to live in Holywell Street until his death two years later on 9th February, 1920. The funeral three days later was in Magdalen College Chapel and his funeral procession proceeded from there to Holywell Cemetery where he was buried. The printed order of service, together with some personal letters, photographs and newspaper cuttings collected by his nephew, Joseph Varley Roberts, are in the archives at Magdalen College (February 1998 Acc. No. 98/46). Above: The choir of Magdalen College, Oxford with John Varley Roberts (seated fourth from right).